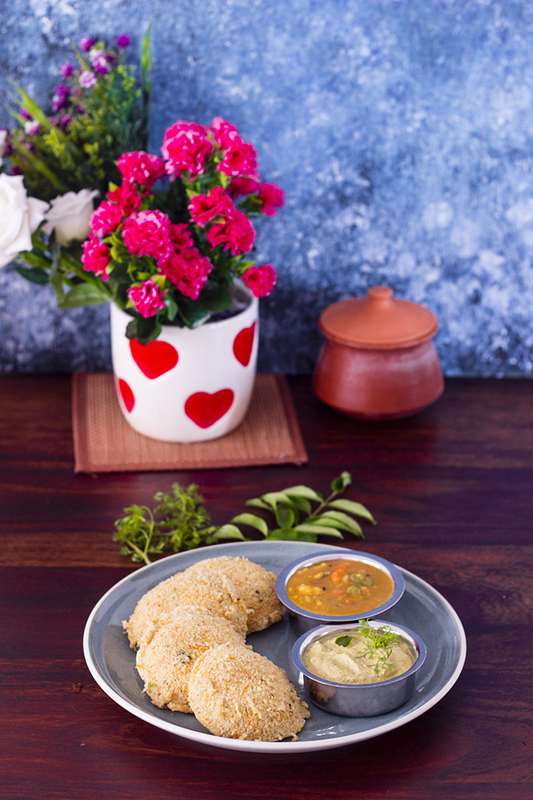 Veg Momos are vegan dumplings stuffed with a stir fried mix of finely chopped vegetables. The dumpling can either be steamed, deep fried or pan fried. This is the recipe for steamed veg momos. Steamed veg momos are a specialty of North East India and these are now a popular street food all through India. I never skip a chance to eat a Momo. But making them, I've had my excuses. I'm glad I finally got around to making some, because I simply loved this recipe and I'm so happy I can share it with you. And unlike what I imagined earlier, it is not that elaborate and no, homemade is so much better than the street side one. So.... a Momo is a dumpling that is native to the Himalayan region, mainly North-East India, Tibet, Nepal and regions around them. In recent times, momos have taken the streets by storm and it is not unusual to see folks selling momos at street corners. They have become extremely popular as street food. My first experience with momo making was in 2009, when we visited Darjeeling. Darjeeling is very famous for momos and I had it in my bucket list to try some there. We used to frequent a small family run restaurant called Nimto that served us vegetarian food. It was here that we saw Auntie (the owner and chef) prepare momos. I was amazed at the speed and quality of the pleating of her momos. While I am nowhere close to her's in aesthetic appeal, I believe I've made up for it with taste. Veg momos are usually stuffed with cabbage and a mix of other finely chopped veggies. A momo is very mild in flavor, it has a subtle hint of ginger, garlic and heat. 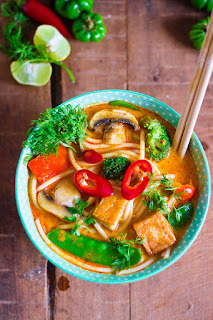 It is usually served with either chilly vinegar or a spicy chilli garlic sauce or a spicy peanut sauce. There are some places that serve momos with mayo but I would never visit those places. In this post and video, I have included details on how to make the momo wrappers as well. 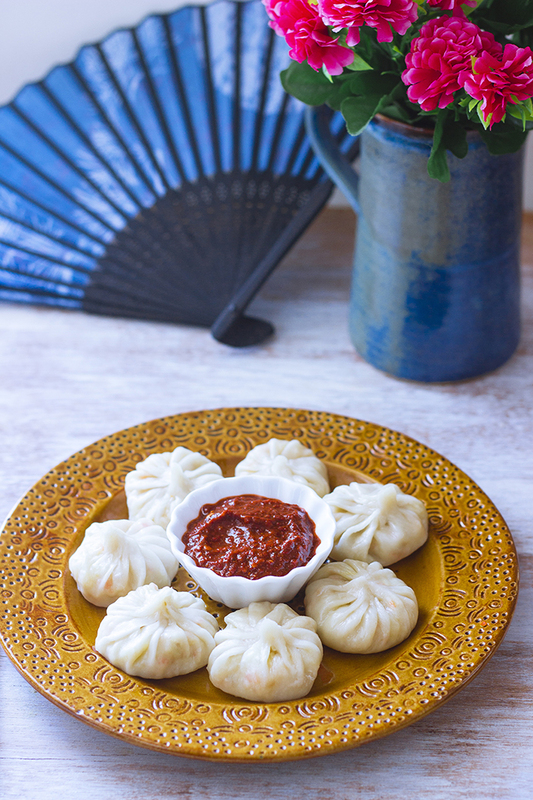 In my next post, I will share a simple recipe to make the Chilli Garlic sauce that I served the momos with. While I did not do it this time, in the past I have frozen momos and steamed them when required. 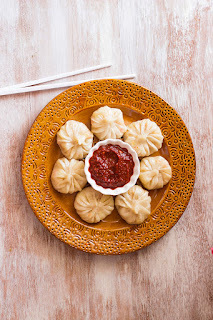 If you plan to freeze momos, place the momos in a large box in a single layer and freeze them. You can then directly steam them (no thawing required) when you want to eat the momos. 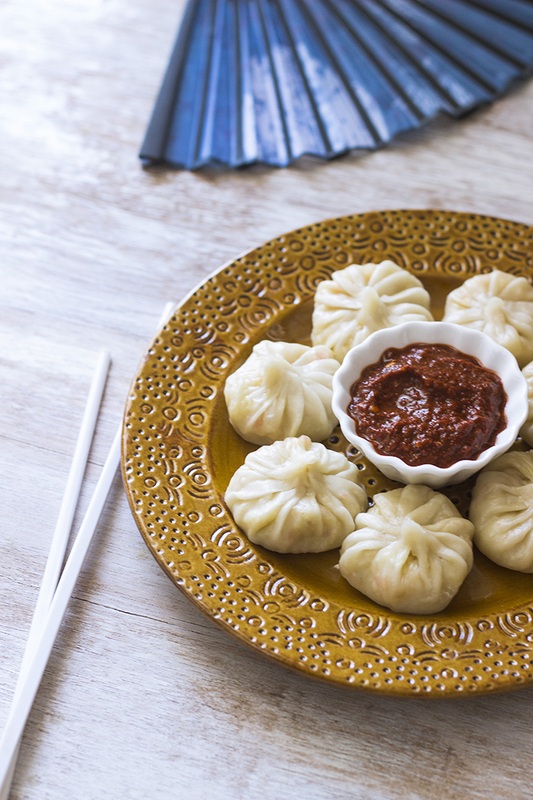 But just serve them hot, momos tend to get chewy if allowed to cool. This recipe shows one method of pleating the momos, this is usually how veg momos are pleated. But feel free to pleat or seal the momos as you please. Look up online, there are several easy ways to pleat. Hope you enjoy this recipe. If you do, please let me know!! Veg Momos are vegan dumplings stuffed with a stir fried mix of finely chopped carrots and cabbage. The dumpling can either be steamed, deep fried or pan fried. This is the recipe for steamed veg momos. Steamed veg momos are a specialty of North East India and these are now a popular street food all through India. 1. To make the dumpling wrappers, take the flour in a large bowl and add salt to it. 2. Now add water by the spoonfuls and knead until you have a smooth dough. Knead the dough for at least 10 minutes to allow the gluten to develop. You can also use cold water to knead the dough, but hot water yields a softer wrapper. 3. Cover and keep aside for 30 minutes to 1 hours. 4. While the wrapper dough is resting, make the filling for the momo. 5. To make the momo filling, heat oil in a pan and add in the chopped garlic, ginger and green chilli. Saute until fragrant. 6. Now add the chopped carrot and saute for 2-3 minutes on medium heat. 7. Add in the chopped cabbage and salt to taste and continue to saute on low heat until the cabbage is almost cooked. 8. Remove from heat and allow to cool down to room temperature. 9. Divide the wrapper dough into 20 equal portions. 10. Fill in 1-2 spoons of filling. 11. Wet the edge with water. 12. Carefully pleat the edges to seal the momos. 13. Steam the momos for 5-6 minutes. 14. Serve hot with chilli sauce. 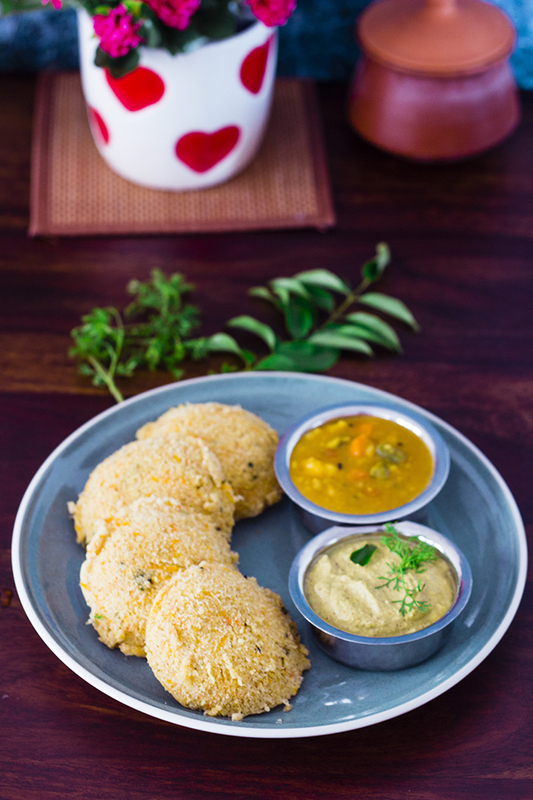 Nuchchina Unde or Nuchinunde are steamed lentil dumplings from South India. 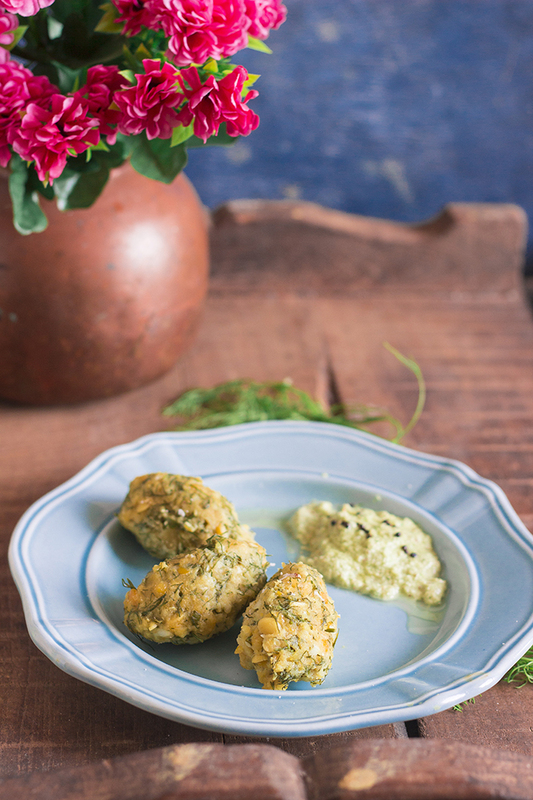 The dumplings are made from mixed lentils and flavored with herbs like curry leaves and dill. 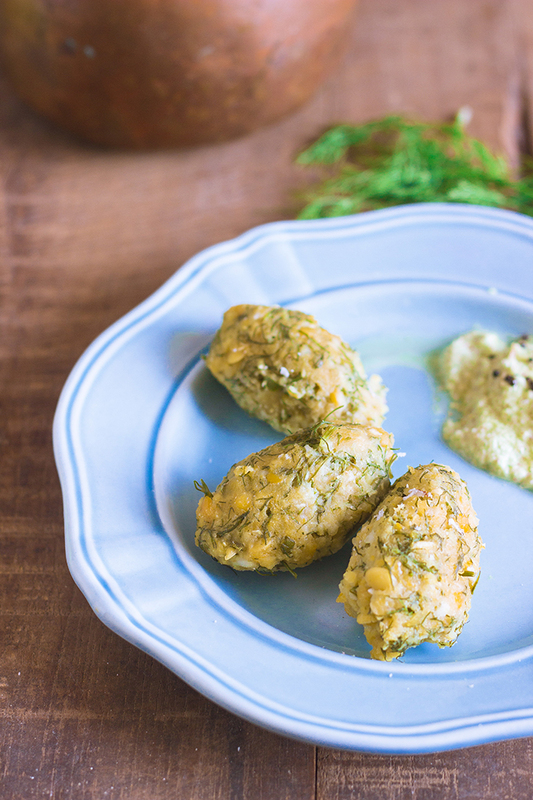 The lentil dumplings are vegan and healthy. So, I just read a quote somewhere, "I start my new year resolutions in February, January was just a trial month". I'm beginning to believe in that. I had so many plans for 2019 and it has been slowly going down the drain. January may have well been my most hectic and tiring month of all time. I had planned to go off sugar, something I've been wanting to do for so long. But I just caved it once the stress rose. Guilty as charged, I am a stress eater and when stressed I crave chocolate, like any other woman on the planet. So yes, I gave in to my chocolate cravings. It also did not help that a colleague of mine got me special candy because I helped him shop last time he was over in India. How does one just ignore such a nice gesture. Very soon 1 candy turned to 20 and I had no control over myself. I had to send the bag over to my sisters. Multiple weddings in January didn't help either. February just started today, let's hope I make this one count. I had also resolved to blog more. But I've actually been blogging less than ever. It's not that I haven't had the time. It's just been one of those fortnights where I want to crawl into bed and watch reruns of TV shows. Currently hooked on to My Kitchen Rules and Come Dine with Me. So what have you been up to recently? How was January? So for all the sugar I ate in January, I'm trying to compensate with these healthy steamed lentil dumplings. It suits all sorts of diets - vegan, plant based, high protein, low fat etc. So you really have no excuse not to try it. If you thought just because it fit all those diets, it does not have flavor, think again! Because if you are a dill lover like me, this one is all Dilly. Pun unintended. 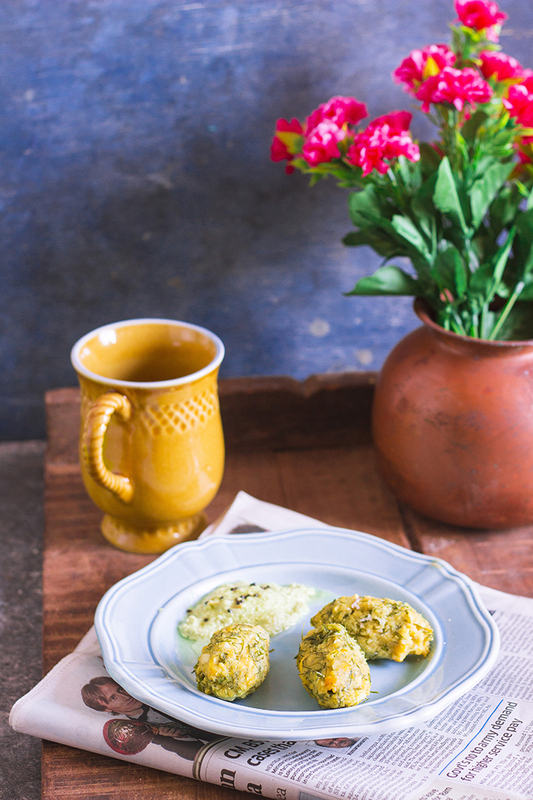 These nucchina unde or lentil dumplings were a breakfast my mom used to make. The first time I tried them I fell in love with them. To make the dumplings, you need to soak mixed lentils for a few hours. You can also leave them soaking overnight. Then drain and grind them coarse. Add in the dill along with coconut, ginger and chilly for added flavor. Shape into dumplings and steam until done. And if you aren't in such a healthy mood, just deep fry them to make Masala Vadas. Tastes great both ways. No matter how you make it, don't forget to serve it along with spicy Chutney. 1. Wash the toor dal and chana dal. Soak the dals in water for 4-6 hours. 2. Drain out the water and coarsely grind the dals without adding any water to the mixer. 3. Remove the dal mixture into a large bowl and add finely chopped green chilli, finely chopped curry leaves, chopped dill leaves, ginger paste, asafoetida (hing) and salt. 4. Mix well until combined and shape into dumplings. If the batter feels watery, add a little besan or chickpea flour. 5. Steam for 10-12 minutes until done. Dhokla is a steamed savory cake that is a favorite of western India. They are usually made of semolina and chickpea flour. 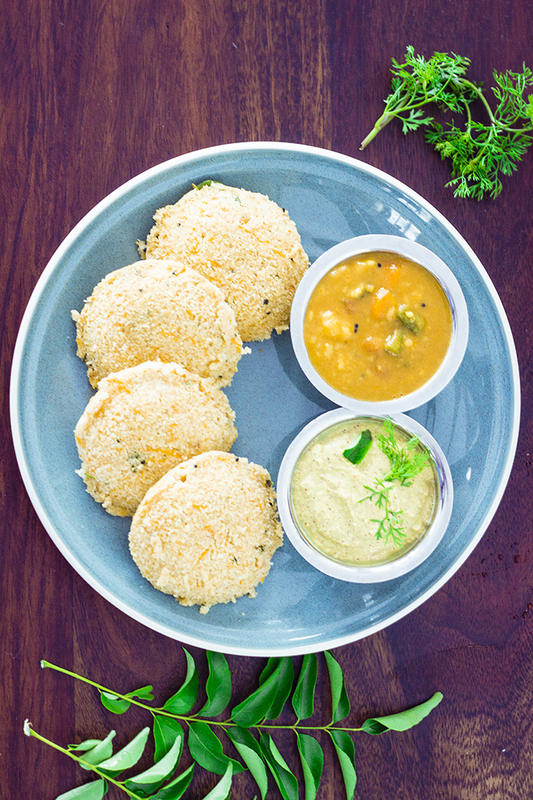 They are light and fluffy and taste delicious with a tangy green chutney. I never knew there was so much variety in something this simple. I was browsing through cookery books in the library when I glanced upon Tarla Dalal’s Non-Fried Snacks. I’m a big fan of non-fried snacks. The book has some good recipes, majorly it has different types of dhoklas and muthias. 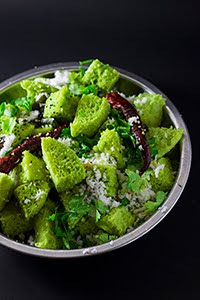 And this Matar Dhokla or Green Peas Dhokla was a featured recipe. 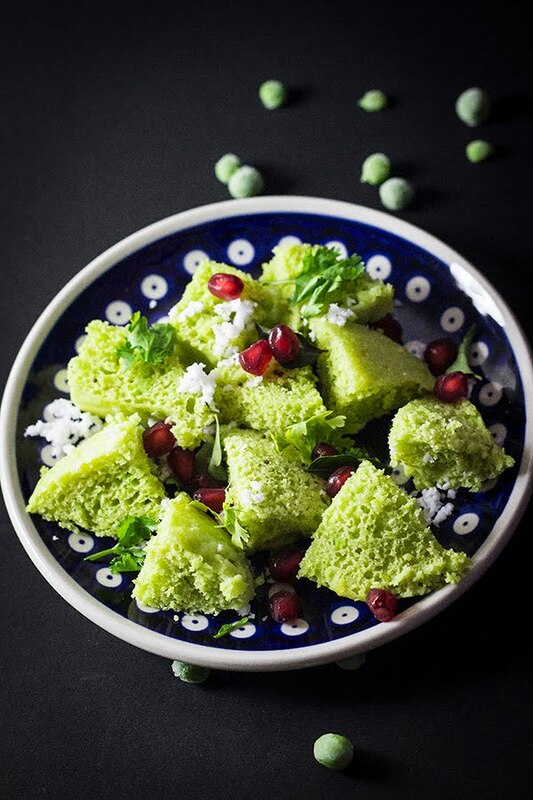 It is still just as simple to make as the regular dhokla, but now has the added goodness of green peas. You can use either fresh or frozen peas, according to what you have available. The addition of peas gives it that lovely vibrant green colour and the slight sweetness of peas. Some people like to soak their dhoklas in a diluted syrup of sugar and lime juice, while some enjoy it with creamy yogurt. It tastes awesome with both. 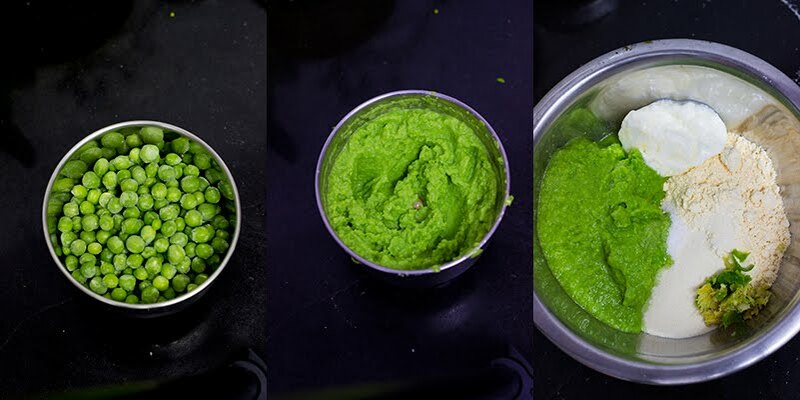 1) Puree the green peas with a little water. 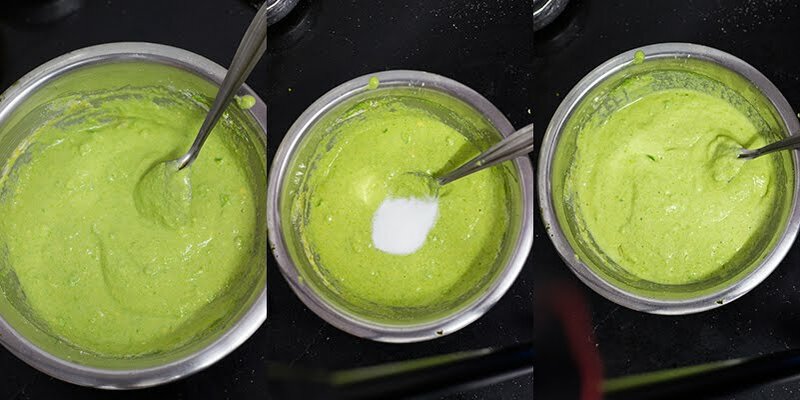 2) Mix together the chickpea flour, semolina, pea puree, salt, ginger- chilli paste, yogurt and salt into a smooth batter. 3) Now add the fruit salt or eno to the batter. Pour the remaining water over it and mix well. It should start getting frothy. 4) Grease a shallow vessel that fits inside the steamer and add the batter to it. 5) Place the vessel in the steamer and steam on medium flame for 12-15 mins. Insert a knife in the middle and if it comes out clean, it is done. 6) Turn off the stove and allow it to rest for around 2-4 mins. 7) Then remove slowly and cut into desired shape. 8) Heat the oil in a pan and add the mustard seeds. 9) Once they splutter, add the curry leaves and chilli and fry for 20-30 seconds. 10) Pour over this tempering on the dhoklas. 11) Garnish with the fresh coconut and the coriander leaves. I also sprinkled a few pomegranate seeds to add some freshness. 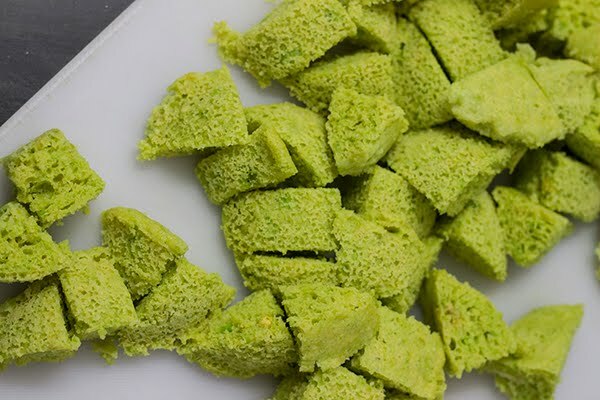 Steamed savory cake made with green peas and chickpea flour. Puree the green peas with a little water. 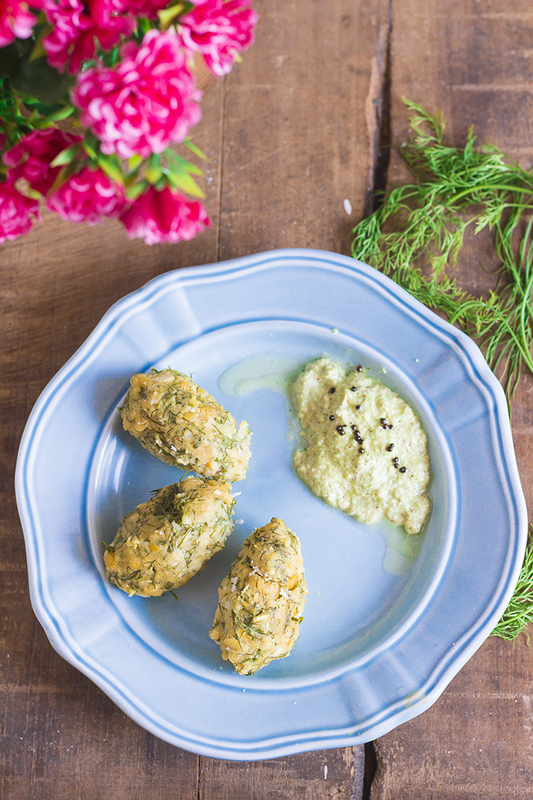 Mix together the chickpea flour, semolina, pea puree, salt, ginger- chilli paste, yogurt and salt into a smooth batter. Now add the fruit salt or eno to the batter. Pour the remaining water over it and mix well. It should start getting frothy. Grease a shallow vessel that fits inside the steamer and add the batter to it. Place the vessel in the steamer and steam on medium flame for 12-15 mins. Insert a knife in the middle and if it comes out clean, it is done. Turn off the stove and allow it to rest for around 2-4 mins. Then remove slowly and cut into desired shape. Once they splutter, add the curry leaves and chilli and fry for 20-30 seconds. Pour over this tempering on the dhoklas. Garnish with the fresh coconut and the coriander leaves. STEAMER - I used an idli steamer. You can use a pressure cooker without the whistle or any deep saucepan with a lid. 1) To prepare it, add around 2-3 cups of water to the steamer and cover and cook on high flame until the water boils. 2) Next place a small flat bottomed vessel or bowl upside down in the steamer. The top of this bowl should be above the level of water. 3) Place the plate / vessel with the dhokla over this upturned bowl. The purpose of the bowl is that the dhokla plate / vessel does not touch the boiling water directly and is slightly higher than the water level. Lord Ganesha's birthday aka Ganesh Chaturthi is celebrated with fervor and grandeur in Goa. People take a nice vacation from their hectic lives and move into their ancestral houses for a week usually. The entire family gets together to welcome Ganesha into their house and hearts. You can see colorful idols of Ganesha everywhere you turn. His throne is decorated with flowers and banana leaf. Everyone is dressed in their festive best. And when everything is at its best, so is the Food. In India, every festival revolves around Food. Ganesh Chaturthi is no exception. While one may not make as many variety of sweets and snacks as one does for Diwali, there are a few that are made especially for beloved Ganesha only. 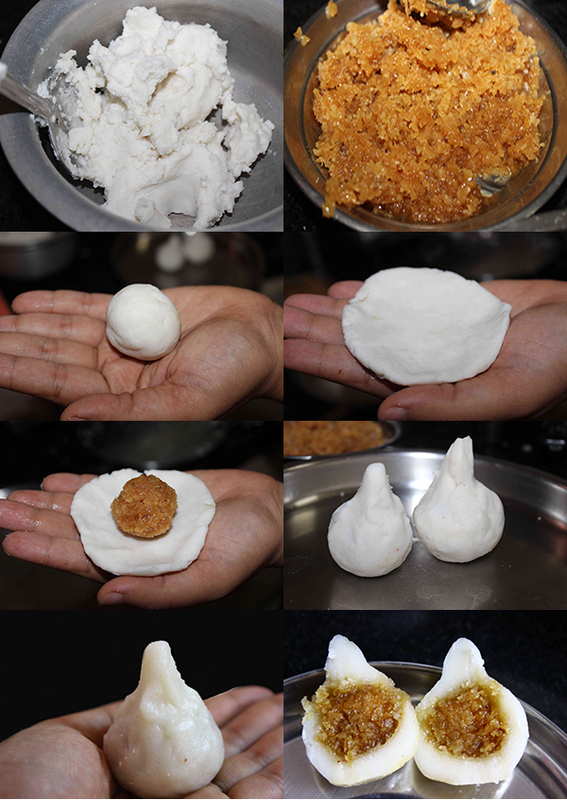 Modaks are considered to be Lord Ganesha's favorite sweet and a must on Ganesh Chaturthi. Modaks are made in myriad different ways. Some deep fry it while some steam it. Sometimes the filling is of fresh coconut and jaggery, while sometimes it is dry coconut and sugar. I have also seen a recipe where it is filled with chocolate. Sometimes all this is skipped and modaks are just modak shaped pedas. In our culture, we do not deep fry modaks. My grand mother was totally against deep frying anything on Ganesh chaturthi so we always made the steamed version stuffed with fresh coconut and jaggery. And this is the version I absolutely LOVE. Steamed Modaks or Ukadiche Modak or Sihi Kadabu have the outer layer made of a rice flour dough and a stuffing of fresh coconut, jaggery (unrefined sugar) and cardamom powder. To make the outer layer of rice flour, the rice flour is added to boiling water and mixed until it forms a stiff dough. Getting the consistency of the dough right is probably the toughest part of making the Modak. If the dough isn't made properly, there are chances that the modaks will split while steaming, which, believe me isn't really as disastrous as it sounds. They still taste great and means just some more modaks for the Cook. Hurray!! The filling is made by cooking together grated fresh coconut and jaggery. In this recipe, the jaggery cannot be replaced with refined sugar, as it just will not live up to the taste and texture of the modak. The mixture is cooked until it the water almost evaporates. Cooking it beyond that will cause the jaggery to crystallize and the filling will become one big hard lump. These days there are moulds available to shape the modaks after filling them. Unfortunately, as you can see in the pictures, I wasn't aware of it until I'd finished making them, hence very amateurish looking modaks in my house this year. But who is worried about the looks when they tasted SO delicious. 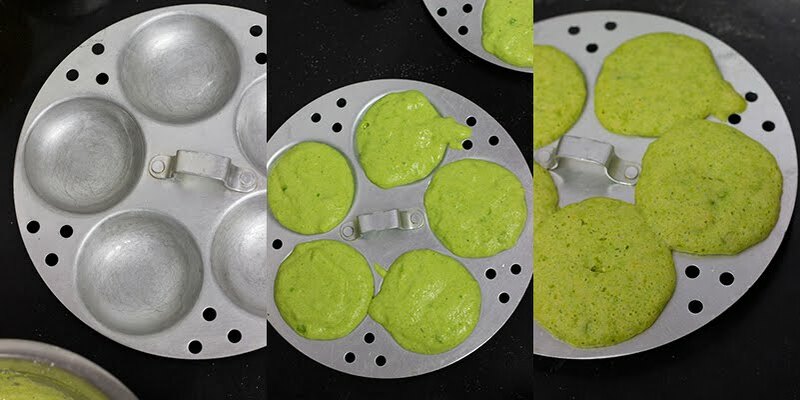 If you are making this for Naivedyam for Lord Ganesha, please do not taste anything and follow the recipe and your instincts and it will turn out great. Khova Peda - Simple peda made from milk solids and sugar. Kaju Katli - Fudge or Barfi made from cashewnuts and sugar. A favorite in every household. Coconut Laddoo - A simple laddoo made from coconut powder and condensed milk in under 1 hour. Modaks are traditional steamed Indian dumpling made from rice flour, coconut and jaggery. Served as an offering to Lord Ganesha in West and South India. In a kadhai, mix the coconut and jaggery and cook on low flame. Keep stirring the mixture to avoid burning. Cook until the mixture is almost dry. Do not overcook as then the jaggery will harden. Add the cardamom powder and keep aside to cool. In another pan, bring 1 cup of water to a rolling boil. Add the salt and the ghee and remove it from the heat. Add rice flour by the spoonful and keep stirring to avoid forming lumps. Add more water if needed. The dough should be slightly stiff yet malleable. Keep the pan back on the stove and keep the flame low. Keep stirring until the whole dough becomes one mass. It will start sticking to the spoon/ spatula. It took me around 5 mins. Take a small marble sized piece of dough and press it using your thumb and index finger, it should not break into pieces. Nor should it stick to your hand. If the consistency or the texture is not correct, the modaks may split while cooking. If it is your first time, do not fret over a few split ones. Allow this to cool for some time. While it is still warm, take a small ball of flour and flatten it. Place a small ball of the filling inside it and use your hands and stretch the flour to cover the filling. Steam the modaks in a steamer for around 8-10 mins. I used an idli steamer, you can use a cooker without the whistle.